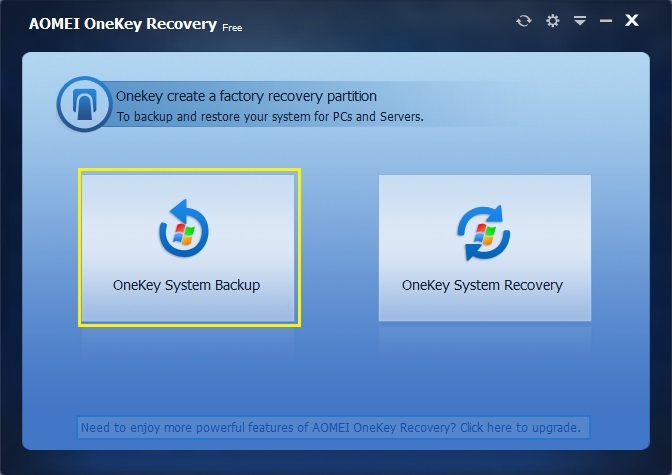 How to Create a Factory Recovery Partition on Windows with AOMEI OneKey Recovery? As a Windows user, you have come across a situation, where your PC may have faced a Boot failure or displayed an Operating system not found an error. If the computer just fails to boot, and if you do not have a system backup image, then there’s a high possibility that you may lose your data. Also, Windows may become slow or unresponsive due to a severe malware attack, thus leaving no other option except to perform a system restore. Some modern branded PC and Laptop comes with OneKey recovery ISO, like Lenovo, so if your operating system is corrupt then by pressing the appropriate Key your system will be reformatted without any bootable CD/DVD. But, what you will do, if OneKey recovery ISO is not available? Once the operating system is corrupt, then you have only the solution to format the PC and install a fresh Windows operating system. Here AOMEI OneKey Recovery could be helpful. It is software that can help you to create a factory recovery partition, make system backups, restore backups in case your system crashes, and use it to restore your computer to its factory default or a previously backed up state. AOMEI OneKey recovery is a small and effective tool and does exactly what it promises. It is the best way to create recovery partitions for computers which do not come with or is missing a factory recovery partition. The program is extremely user-friendly and hence easy to use. The interface is simple, with no unnecessary buttons or settings. It is so simple to use, download and install in the PC, launch the software and click on “OneKey System Backup”. It will make the backup of your PC boot file and whole Windows installation drive. The Free edition only supports backup system to factory partition, so you need enough free space on your primary drive for the recovery partition to squeeze into. Once you backup the system, you’ll be able to recover your system via the AOMEI recovery environment. Then it’s just a case of restoring your computer to the state it was in when you took the backup. For most of the computers, you can press a special keyboard button – “F11” (default) or “A” key when your computer starts up to enter into Windows PE environment, and then automatically launch AOMEI OneKey Recovery. For the computers with EFI/UEFI boot, you can enter into the program to restore your system by using Windows Boot Menu. Of course, AOMEI OneKey allows you to configure how to display the boot menu by options. AOMEI OneKey Recovery Free is freeware designed to backup and restore your operating system. If you need backup files, partitions, disks and so on, you can download backup software – AOMEI Backupper. The features of Free Edition are limited, such as you can’t backup system to other location, can’t compress the image file, can’t set encryption for backup. If you need these advanced features you can choose the paid edition of AOMEI OneKey Recovery. There are four paid editions of AOMEI OneKey Recovery: Professional, Premium, Technician and Customization. You can read their difference in edition comparison of AOMEI OneKey Recovery here. How to Divide Hard Disk into Partitions Using AOMEI Partition Assistant Standard? How to Backup Your Data With AOMEI Backupper Standard?